Appu, Akash, Arasu, Ajay, Vamshi, Milana, Raj, Raam are just a few successful films in Puneet Rajkumar's kitty. The youngest son of late superstar Rajkumar is now gearing up for his big release Prithvi. Incidentally, April 24 is the birth anniversary of the late veteran. In a freewheeling chat with rediff.com, Puneet talks about his upcoming film, being a Rajkumar and his book. How different is Prithvi from your previous films? This is my thirteenth film and it has shaped up really well. Technically it surely goes a notch higher. Director Jacob Verghese has made a very aesthetic film. I play a district commissioner in the film. What do you have to say about your co-star Parvathi Menon? We shared a great onscreen chemistry in Milana. So it was nice working with her again. She is a very dedicated actress and gives her 100 per cent to everything she does. Are you through with the book you were writing on your father? The book is titled Person Behind the Personality. The biography which is dominated by photographs will introduce you to Rajkumar both as an actor and a human being. Each page will have a different story to tell. I am writing the book in English as I want to make known the story of Rajkumar to the entire country. I will divulge more information on the book on April 24, my father's birthday. What is the one advice your father gave you that has helped you shape your career and life? 'Follow your heart' is what he always said, and I've been doing just that. I do projects that I feel will give me satisfaction. Is being a Rajkumar an advantage or disadvantage? I have never looked at things that way. 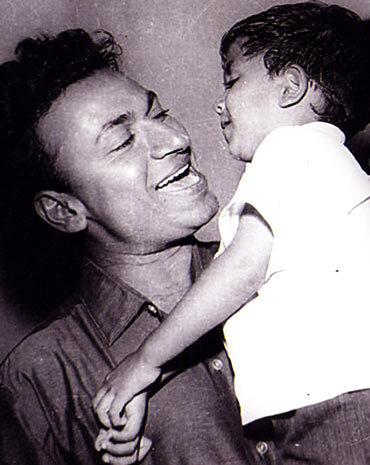 In fact if anything, being Rajkumar's son meant a lot of responsibility. There are a lot of expectations to be met. I just focus on doing good work. Which of your films do you consider as your best? I am yet to give my best and an artiste should never feel satisfied with what he has done, for only then will he be able to outdo himself each time. But I felt happy with my debut performance as my father had watched the movie eight times. Though he directly didn't say anything to me, the fact that he had watched Appu so many times, more than anyone else in the family, was compliment enough for me. Is there a particular genre you are looking to do? I want to do every kind of role. My preferences keep changing with each day. I'm open to experimentation. Did your award winning experience in Bettada Hoovu and popular role in Bhakta Prahalada as a child help you in any way? As an actor, I have grown only with my films. I was too young to understand film making when I did those films. It is true that I spent a lot more time in studios than in schools. But I was usually seen playing games in the studios than getting to know how films were made. The thing I really liked about films then was that it gave me a chance to travel across India with my father. In fact, films were never on my agenda. I wanted to be a businessman and was an entrepreneur for a while. But my family thought I should get into acting and here I am. Awards don't matter to me as much as people's responses. I am here because of them. I treat their judgment as the final word. Yes, probably in the next four-five years, I will direct. Whatever the subject, my elder brother Shivarajkumar will be the hero. He is a fantastic actor. Who are your other favourite actors? My father is my dream hero. I enjoy watching Ravichandran, Rajnikanth, Kamal Haasan, Surya, Aamir Khan and Shah Rukh Khan. You have sung some popular songs in your movies. Is singing something that you were inclined to from younger days? No, this was also an experiment. I credit the success of these songs to good music and lyrics. There is Production No 1 and Jackie apart from an untitled Yograj Bhatt film. I will also be starring in the remake of the Tamil film Nadodigal. It will be my home production. What do you think needs to be done to improve the quality of Kannada films? I am too young to comment on this. Having said that, I feel we need to come up with better concepts. Improvements are required in the script and screenplay departments. The 80s saw some of the best Kannada films and we need to recreate that magic and make films that can inspire film makers from other industries. Going by the films that are being made this year, we are moving in the right direction. What also can't be ignored is that our budgets are smaller than those of other industries. You took time off to be the brand ambassador of Royal Challengers Bangalore, this IPL. How was the experience been? I had great fun. I am big time into watching cricket. While football, squash, hiking and running are my favourites, cricket tops the list of preferences. So it has been a pleasure to endorse a cricket team. Team captain Anil Kumble is a friend but this assignment has given me an opportunity to meet other cricketers. Actress Ramya, who is also a brand ambassador, was a great help in understanding the process.